Philipp Rosenthal (1855-1937) began business in Germany in 1884. Initially he purchased white ware from the company Hutschenreuther which was resold door to door after being hand-painted by his wife Maria. 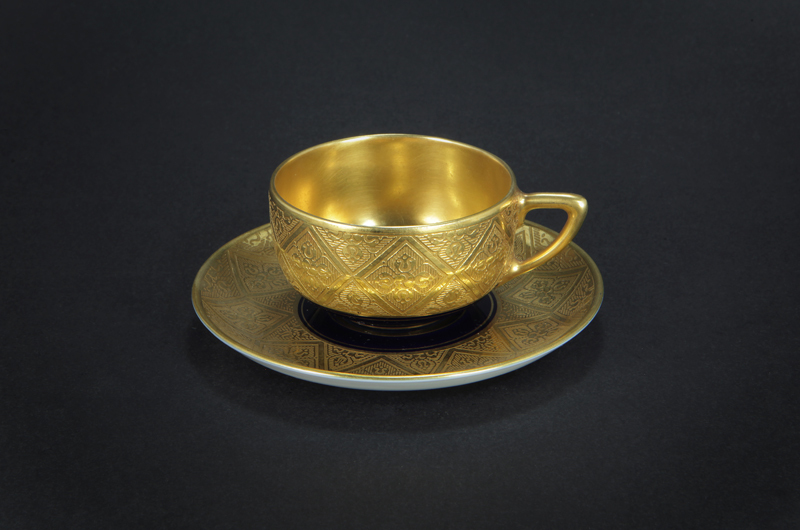 In 1891, he established a factory in Asch, Bohemia and began production of his own white ware. From 1897 to 1934, Rosenthal acquired further factories in Kronach, Marktredwitz, Selb, Waldenburg, Sophienthal, and Waldershof. The Marktredwitz factory acquisition in 1908 included the brand name Thomas. During the latter part of 1934 the Rosenthal family came under significant pressure from the growth of German Nationalism which ultimately lead to the family having no participation in the management of the company. Philipp Rosenthal was exiled in 1935 at which time the Rosenthal company employed more than 5,000 people across 10 different companies. He died in 1937 following which the family emigrated abroad. At the outbreak of World War II Philip Jr. joined the Scottish Air Force and subsequently the French Foreign Legion and the British Foreign Office. The Rosenthal company continued a somewhat limited production throughout World War II under the leadership of the Political/Military Regime. When World War II ended Philip Jr. returned to Germany in an attempt to reclaim family assets and control of the company. The conflicts of interest between the various parties (i.e. Owners, Politicians & U.S. Military Government) resulted in no settlement being achieved until September 1950. When he finally returned to the company Philip Jr. modernized out of date factories, identified new sources of supply and re-establish lost markets. Raymond Loewy, from France but based in the United States, was critical in successfully designing more streamlined and contemporary looks for the important American market, The Rosenthal Board of Directors introduced production changes from the lessons learnt and gave support to Philip Jr.’s intention to continue hiring the best artists of the time which included Bjorn Wiinblad from Denmark, Hans Theo Baumann from Germany, Raymond Peynet from France and Tapio Wirkkala from Finland. During 1997 Waterford Wedgwood plc purchased sufficient shares in Rosenthal to give it majority control. Hutschenreuther became part of the Rosenthal division of the Waterford Wedgwood Group in 2000. In 2009 Waterford Wedgwood was placed in receivership which resulted in Rosenthal being purchased by Italian designer kitchenware firm Sambonet. The takeover included all employees, trademark rights, patents and production facilities. The new company trades as Rosenthal GmbH.